Sometimes when kids come into the clinic, we have a definite plan for what will happen during your child’s OT session. Some days, we have evaluations to complete, specific programs to teach or caregiver training to be done. Other times, we know what we would like to work on, but don’t have a solid idea of the activities we will be using. It is during those times that we rely on following your child’s lead. You can do this at home, too. It takes the pressure off after long and busy days to let your child figure out what you can do. You might want to set some parameters such as “I have to be cooking dinner, but you have my eyes and my brain. How about I-Spy?” Or “we have to leave to pick up your sister in half an hour. What can we do in only 30 minutes?” Guiding your child in some of the overall rules helps to limit frustration that you are not giving your undivided attention. In the clinic, we often do this: you have an idea, then I have an idea. Eventually, we find that smaller ideas lead to bigger ones and pretty soon we don’t know where the time went! When you give some control to your child, you are helping to grown their brains by forming new “problem solving” patterns. When a peer is present, it requires even more negotiating so that everyone is ready and willing to do the activity. Of course as professionals, we guide the activity to be therapeutic and correspond to your child’s goals. But we don’t tell them that! All they know is that it’s fun. 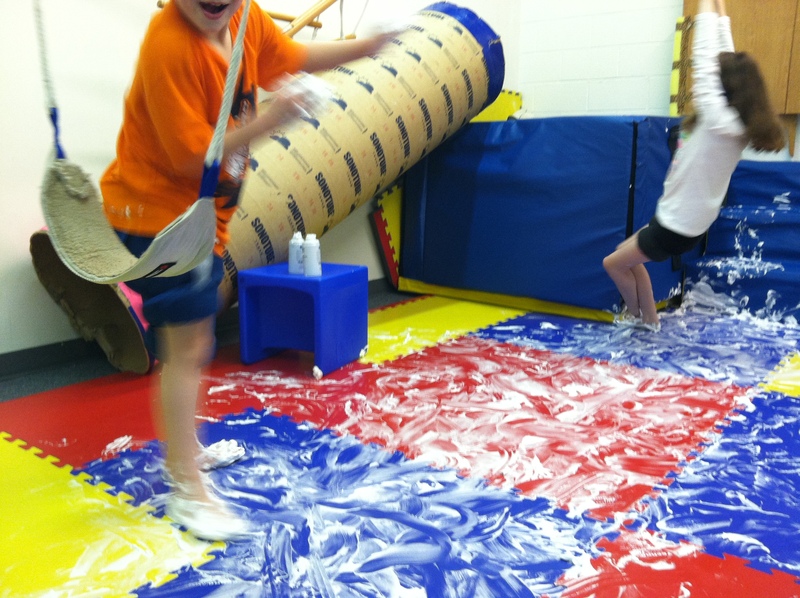 Recently, Mandy and Kristen did some impromptu messy play at the Portland clinic. Check out the fun results! 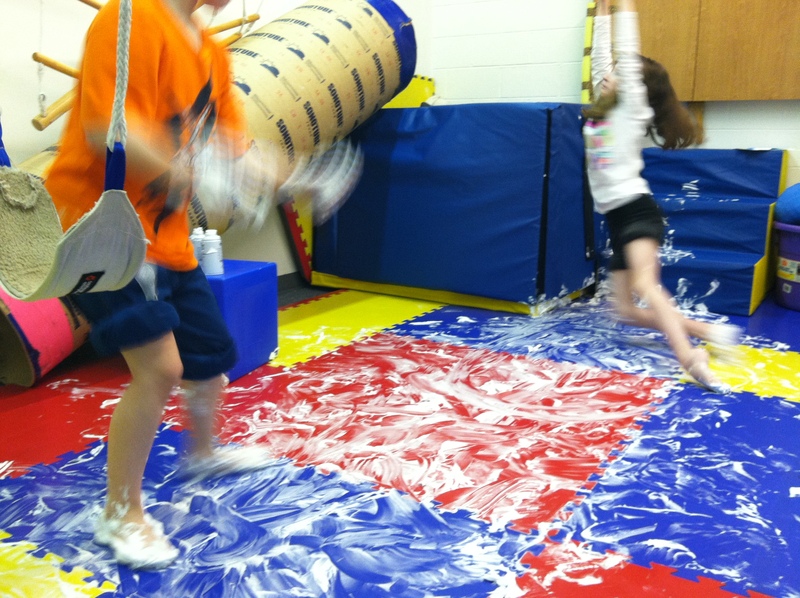 A lot of shaving cream and a lot of movement mean a lot of fun. You can also use Hanen’s (program designed to help kids communicate) recipe for success in following your child’s lead. First, include the child’s interests. If your child loves animals, make a game about animal sounds or animal walks. Second, interpret. You may say things like “Wow, you are really smiling. You must like doing that.” Third, imitate. This doesn’t mean make fun of your child or other kids, it means be willing to imitate what your child is doing. If they are sitting, you can sit with them. If you are acting like firemen, you can imitate what firemen do and how they sound. Next, you can intrude. When they are in the middle of playing, you can stop and say “Wait a minute! I’m confused, I thought we were playing chef and now you are playing teacher. I need some help.” Hanen is a great program, but it’s not the only way to follow a child’s lead. The best part is you get to experiment and relieve yourself of having to orchestrate elaborate games when something simple may actually be a lot more fun. What a great post by The Sensory Spectrum on giving yourself a little parent TLC. With SPD kiddos, we can often lose ourselves in the mix as parents and as people. How about picking one of the happiness boosters list below and deciding to work toward it today, even among the chaos? Let me know which one you picked!